Netflix error code UI-800-3 is an error code that usually indicates that there is some kind of problem with the data that the Netflix app has stored on your device. There could be a problem with cached data, or with the app itself, so fixing this error code requires you to go through a number of steps. Since error code UI-800-3 can occur on so many different devices, some troubleshooting steps will not apply to your specific device. The general things that you will need to do to fix this error code include shutting down your device, resetting or refreshing the Netflix app, and reinstalling the Netflix app. This error is associated with a variety of streaming devices, including Amazon Fire TV, Blu-ray players, smart televisions, and game consoles. 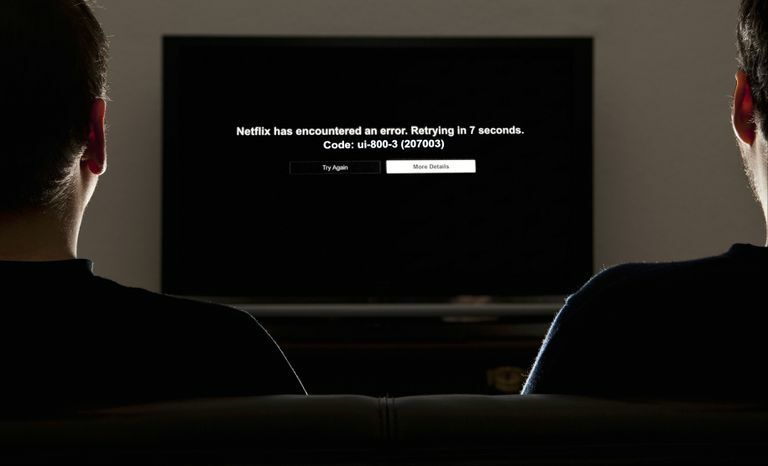 Netflix error code UI 800-3 usually indicates that there is a problem with the Netflix app on your device, or the data stored by the app has been corrupted. These problems can usually be solved by refreshing the information stored on your device. This is the easiest way to fix error code UI-800-3, so it should be the first thing you try. If it doesn't work, then you can move on to more complicated steps. In some cases, simply signing out of Netflix, and then signing back in, is enough to refresh your data and clear this error. Some devices don't have an option to sign out of Netflix. Instead, these devices allow you to reset your Netflix settings. This will refresh the data and allow you to sign back in. Clear the Netflix app data or cache. Some streaming devices allow you to clear locally stored data, or clear the Netflix app cache, without uninstalling the app. This is pretty quick, so you should try it before uninstalling. Uninstall the Netflix app, and reinstall it. When the Netflix app has no option to clear the cache or delete local data, then you need to actually uninstall and reinstall the app. This is also necessary in cases where clearing the cache doesn't fix the problem. Error code UI-800-3 can occur on many different devices, and the exact steps to fix the problem are different from one device to the next. Some devices allow you sign in and out of Netflix, while others only have an option to reset your Netflix settings. Some devices also allow you to clear the data or cache, and others don't. In some cases, fixing error code UI-800-3 is as simple as power cycling your streaming device. This involves completely shutting down the device, if possible, and then unplugging it from power. You need to leave it unplugged for a while, sometimes up to one minute, for this to work. Shut down your streaming device. If your streaming device has a sleep mode, make sure to actually shut it down. If your streaming device has no option to turn it off, just move on to the next step. Unplug both your streaming device and your television from power. Leave your streaming device and television unplugged for at least one minute. Plug your streaming device and television back in. Signing out of Netflix, and then signing back in, sometimes refreshes the problematic data enough to get rid of code UI-800-3. Since this is another easy fix, it should be one of the first things that you try. Some streaming devices don't allow you to sign out of Netflix. These devices typically allow you to reset the Netflix settings, which essentially returns the app to the state it was in when you first downloaded it. This can effectively refresh the locally stored data, and you will have to sign back in afterward. In the settings section, click Sign out all devices. This will sign out every single device that you have tied to your account. You will need to reconnect or sign in to each device separately. After signing out of Netflix, and signing back in, you should check to see if you can stream anything. If you can't, then you will need to move on to more complicated fixes. Some devices allow you to clear the Netflix cache, or delete local data, though a menu option. Others automatically clear this cache when you power cycle them. If your device has no option to clear the cache or delete local data, then shutting the device down, unplugging it, and then plugging it back in is all you can do. Press the home button on your Fire TV remote. Select Clear data a second time. Unplug your Fire TV device for at least one minute. Plug your Fire TV back in and check to see if Netflix works. Press the home button on your remote five times. Press the up arrow button once. Press the fast rewind button twice. Note: You can't clear the data for an individual channel on a Roku. Even when there is no way to reset or clear the Netflix cache on a specific device, there is a hidden reset procedure that works on most devices. This is not a normal menu option, and it requires you to enter a specific sequence of inputs on your remote control or game controller. Press up on the controller or remote control twice. Sign back into Netflix, and see if you can stream anything. If clearing the cache or resetting the Netflix app doesn't work, then you will need to delete the app from your device. Once the app has been removed, you can reinstall it, sign back in, and check to see if you can stream. Some devices come with the Netflix app, and you can't uninstall it. If you have one of these devices, then this isn't an option. Other devices refer to the Netflix app as something else, such as the Netflix channel on Roku. Regardless of whether the Netflix app is called an app, channel, or something else, removing it and then reinstalling it will effectively clear and refresh the local data, which usually fixes error code UI-800-3. If you have a Samsung TV, then fixing error code UI-800-3 may require you to reset your Smart Hub. This process is a little different depending on whether or not your remote has a number pad. Resetting your Smart Hub removes all of your apps, not just Netflix. To use your apps again, they will need to be downloaded. If you get a black screen when trying an app like Netflix after the reset, wait for the download and installation process to complete and try again later. Note: Smart Hub cannot be reset when in use. Select Settings > Support > Self Diagnosis. Note: The default PIN is 0000. If you have changed your PIN, and you don't remember what it is, you will need to contact Samsung.